An "unsharp mask" is actually used to sharpen an image, contrary to what its name might lead you to believe. Sharpening can help you emphasize texture and detail, and is critical when post-processing most digital images. Unsharp masks are probably the most common type of sharpening, and can be performed with nearly any image editing software (such as Photoshop). An unsharp mask cannot create additional detail, but it can greatly enhance the appearance of detail by increasing small-scale acutance. The sharpening process works by utilizing a slightly blurred version of the original image. This is then subtracted away from the original to detect the presence of edges, creating the unsharp mask (effectively a high-pass filter). Contrast is then selectively increased along these edges using this mask — leaving behind a sharper final image. Note: Step 2 combines the three images using a "mask overlay," which is when image information from the layer above the unsharp mask passes through and replaces the layer below in a way which is proportional to the brightness in that region of the mask. The upper image does not contribute to the final for regions where the mask is black, while it completely replaces the layer below in regions where the unsharp mask is white. Note how it does not transform the edges of the letter into an ideal "step," but instead exaggerates the light and dark edges of the transition. An unsharp mask improves sharpness by increasing acutance, although resolution remains the same (see sharpness: resolution and acutance). Note: Unsharp masks are not new to photography. They were traditionally performed with film by utilizing a softer, slightly out of focus image (which would act as the unsharp mask). The positive of the unsharp mask was then sandwiched with the negative of the original image and made into a print. This was used more to enhance local contrast than small-scale detail. Fortunately, sharpening with an unsharp mask in Photoshop and other image editing programs is quick and easy. 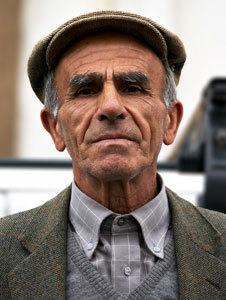 It can be accessed in Adobe Photoshop by clicking on the following drop-down menus: Filter > Sharpen > Unsharp Mask. 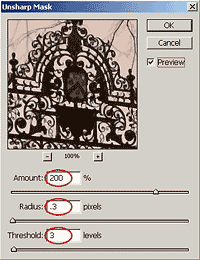 Using the unsharp mask requires understanding its three settings: "Amount," "Radius," and "Threshold." Amount is usually listed as a percentage, and controls the magnitude of each overshoot. This can also be thought of as how much contrast is added at the edges. Radius controls the amount to blur the original for creating the mask, shown by "blurred copy" in the TEXT illustration above. This affects the size of the edges you wish to enhance, so a smaller radius enhances smaller-scale detail. 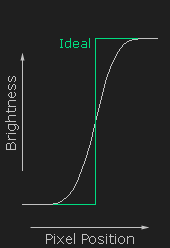 Threshold sets the minimum brightness change that will be sharpened. This is equivalent to clipping off the darkest non-black pixel levels in the unsharp mask. The threshold setting can be used to sharpen pronounced edges, while leaving subtle edges untouched. This is especially useful to avoid amplifying noise, or to sharpen an eye lash without also roughening skin texture. Unsharp masks are wonderful at sharpening images, however too much sharpening can also introduce "halo artifacts." These are visible as light/dark outlines or halos near edges. Halos artifacts become a problem when the light and dark over and undershoots become so large that they are clearly visible at the intended viewing distance. Remedies: The appearance of halos can be greatly reduced by using a smaller radius value for the unsharp mask. Alternatively, one could employ one of the more advanced sharpening techniques (coming soon). When red is subtracted away from the neutral gray background at the edges (middle image), this produces cyan color shifts where the overshoot occurs (see subtractive color mixing). 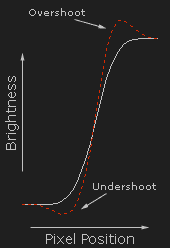 If the unsharp mask were only performed on the luminance channel (right image), then the overshoot is light red and the undershoot (barely visible) becomes dark red — avoiding the color shift. 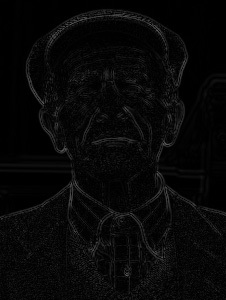 Move your mouse over unsharp mask and sharpened to see how the sharpened image compares with the softer original image. The difference can often be quite striking. 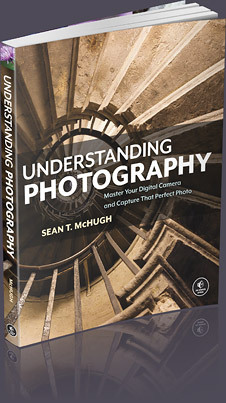 For a more practical discussion, also see this website's Guide to Image Sharpening. Learn another use for an unsharp mask with "local contrast enhancement"